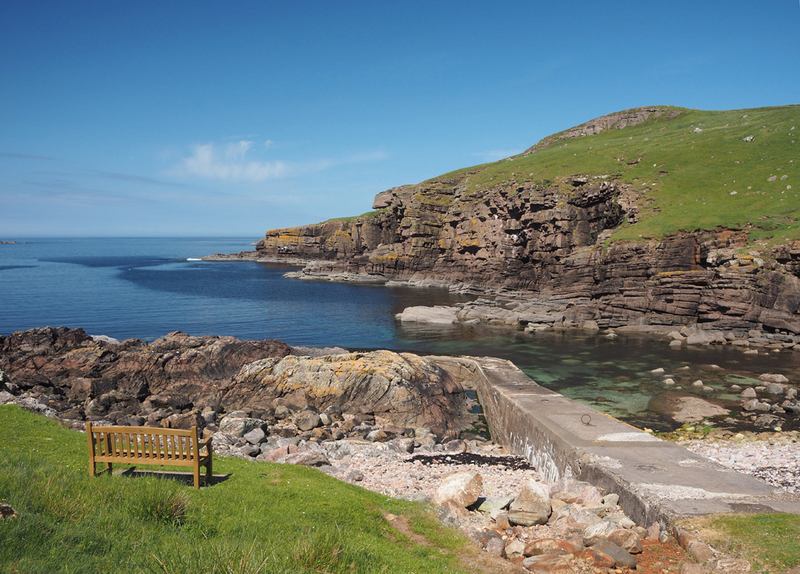 It’s some of the most spectacular scenery in the world, and it’s on Orkney’s doorstep. Bob Tateson retired from teaching in Orkney to live in Lairg, and he has been out and about in a period of fine spring weather with his camera to show some of the scale of the landscape and its sheer variety. The far North West of mainland Scotland from Kylesku to Cape Wrath has a reputation for being grey and windy. A spell of blue-skies weather in May gave me the opportunity to show the district in a different light. The snow lingers on the tops well after the whins are in bloom. 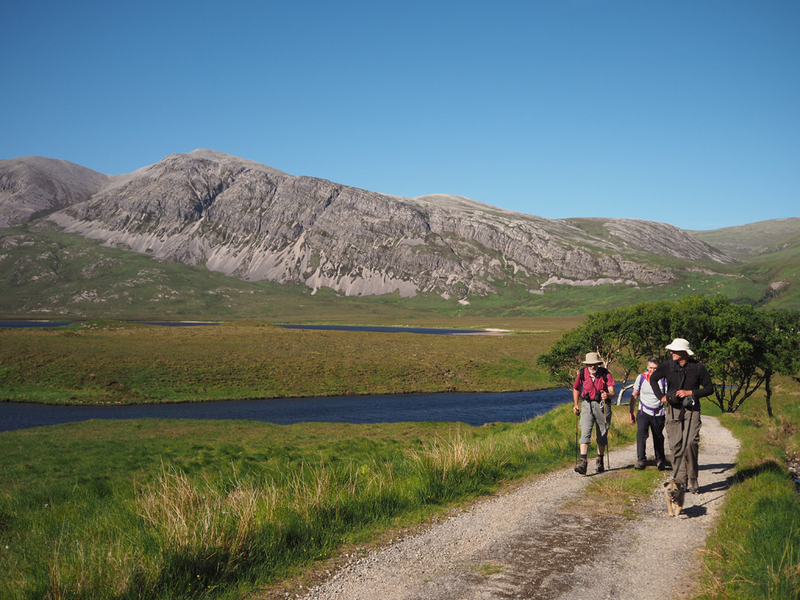 Quinag is owned by the wild land charity The John Muir Trust. 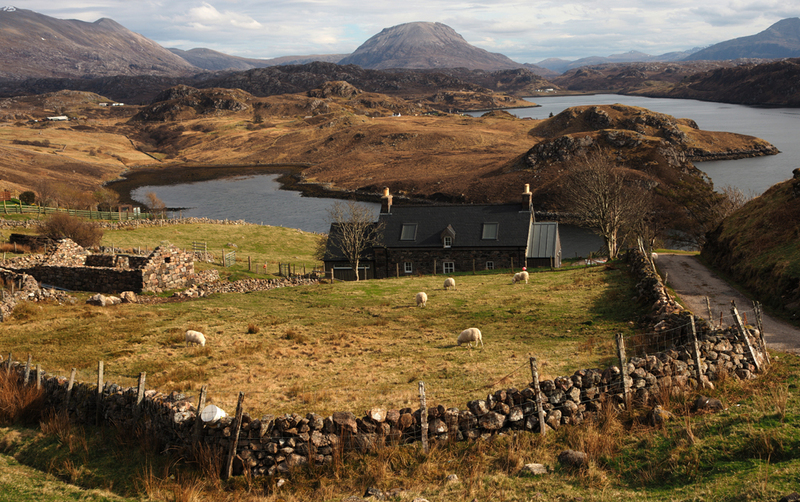 They also own the Sandwood Estate a little further north, which includes the beautiful Sandwood Bay. May is probably the best time of year for motorists to visit the district. 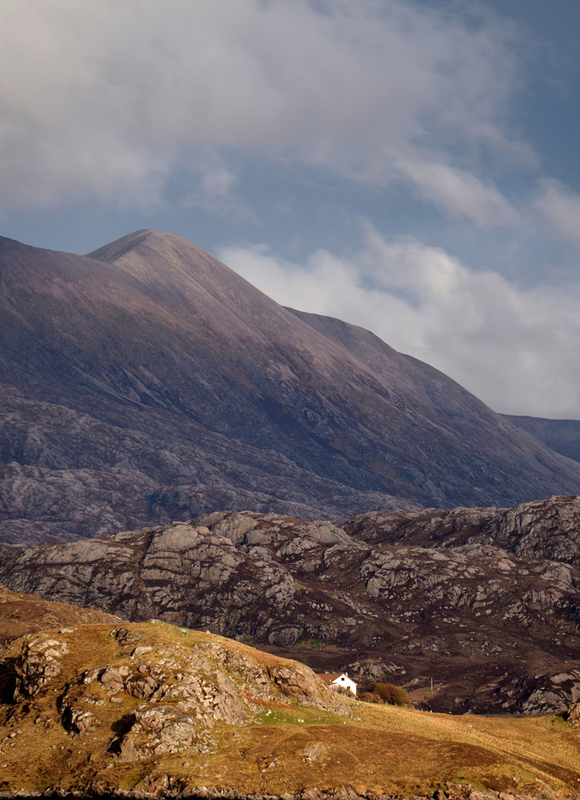 The recent publicity generated by the NC 500 (North Coast 500 road trip) has encouraged more people to visit and is very popular with camper vans, motor cyclists and sports car clubs. 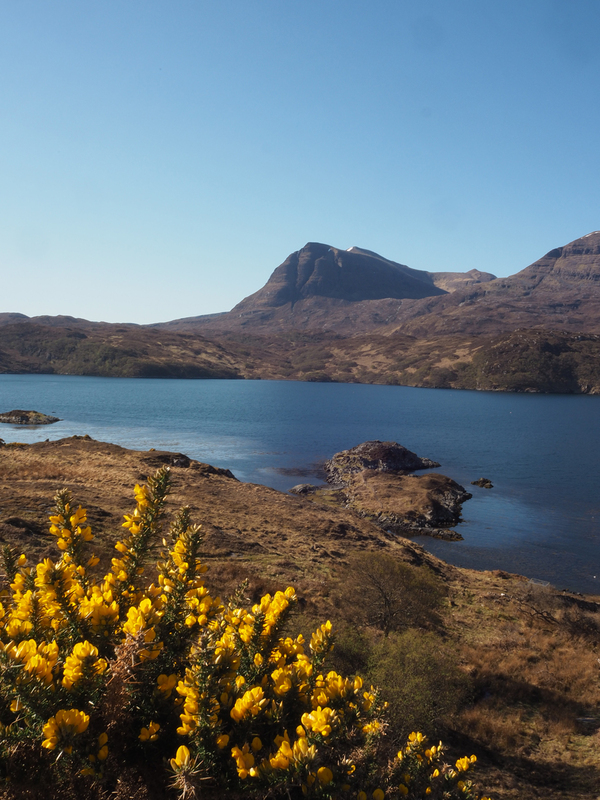 There is an ongoing debate among locals whether the extra revenue brought into the tourist trade compensates for the overcrowding on Sutherland’s single-track roads. 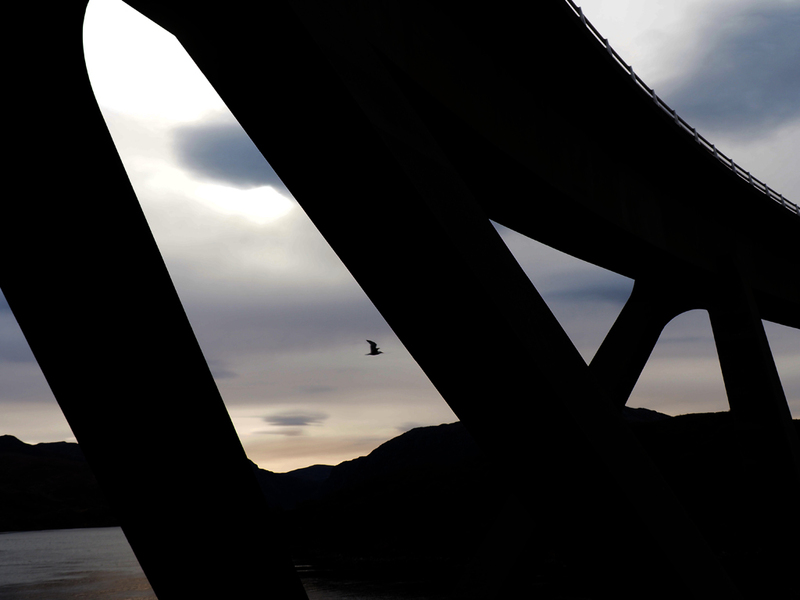 The largest human construction in NW Sutherland curves gracefully over the waters of Kylestrome. The bridge opened to traffic in July 1984. It is the start of a stretch of improved road heading northwards. For motorists the well surfaced, broad highway passing through deep cuttings and over embankments is a welcome contrast to Sutherland’s twisting, up-down, single-track roads. The sporting estates make a living from them. Environmentalists, shepherds, gardeners and motorists think there are too many of them. Tourists like photographing them. Everyone argues about them. Traditional croft houses are often replaced with modern ones. 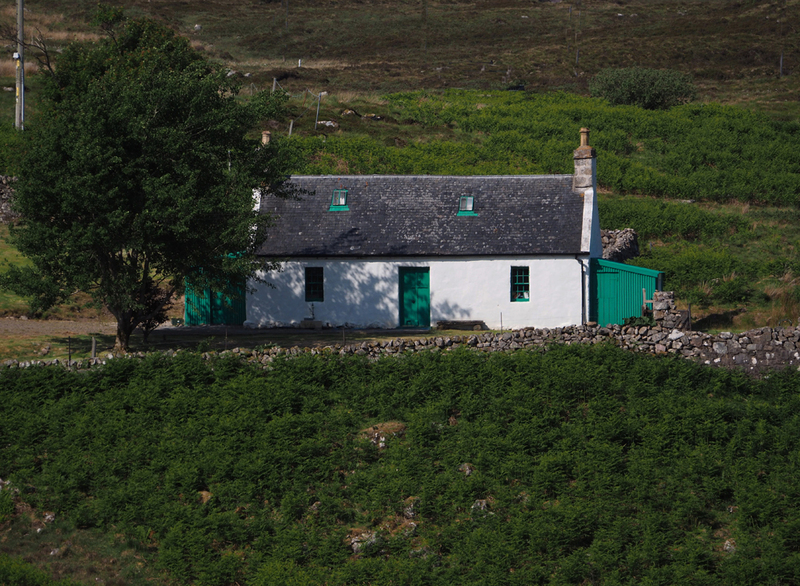 The old one is sometimes treated to a coat of new paint and used as a holiday let to gain extra income for the croft. Oldshoremore beach is popular with local people from Kinlochbervie and with surfers. 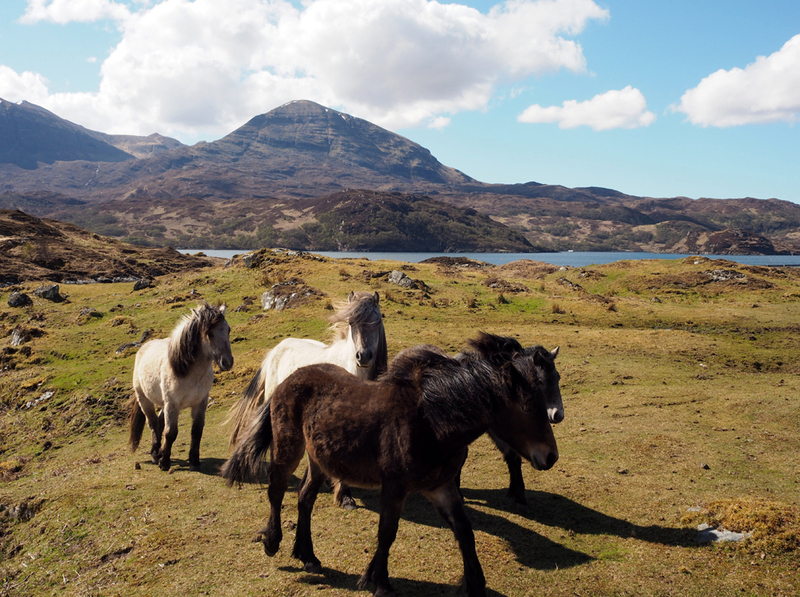 These mares and foals are on the Reay Estate. 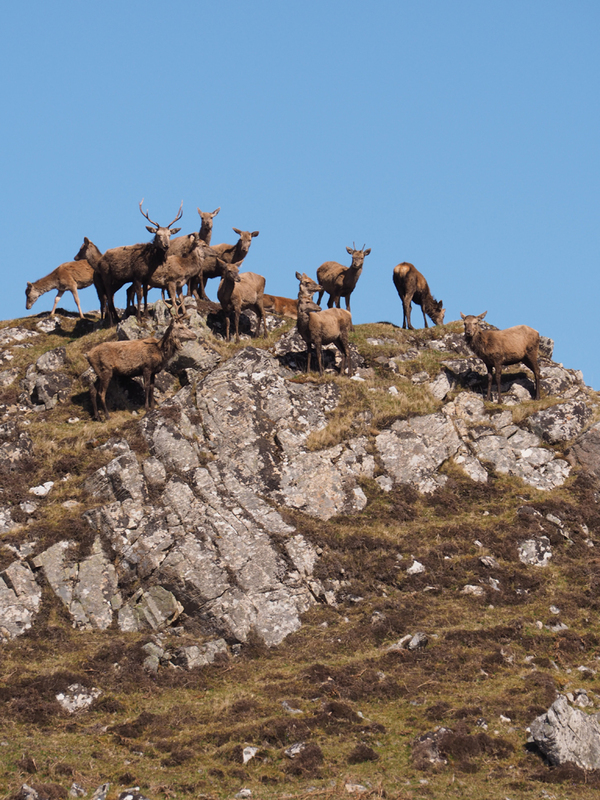 They are still used occasionally to bring shot stags down off the hill. The bench is in memory of Bridget Graham, the much loved Postmistress at Balchrick. A good place to sit. 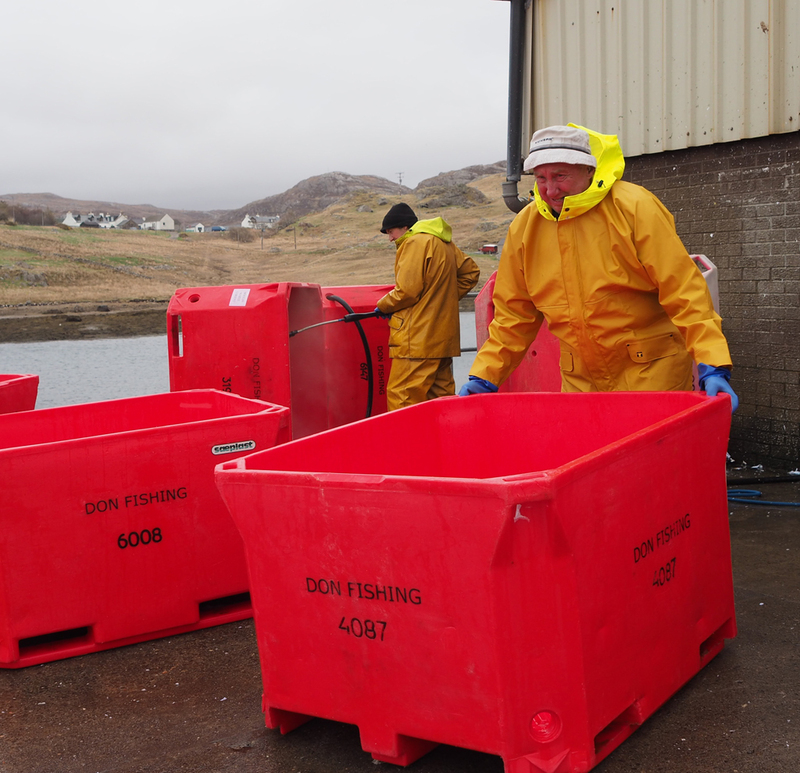 Alistair ‘Tattie’ Corbett’ helps clean fish boxes at Kinlochbervie Mart. Fish landings provide several, much needed, local jobs. Some trawlers are based here and it is also the most north westerly landing place for white fish on the mainland of Scotland. The fresh fish is transported south by a fleet of very large, green, articulated lorries. The post code IV27 4.. covers hundreds of square kilometres – but very few people. Morrison and Mackay are the most common surnames. The Morrisons have probably been here since the Vikings. The word ’Sutherland’ will make sense to Orcadians. Some Mackays were moved here from the centre of Sutherland during the infamous Highland Clearances. The postal address of every croft is a rather officious number. The numbers go all the way up into the three hundreds! It is as if Kinlochbervie was a long, long street in a city. Maybe this is a reflection of the impersonal way families were evicted and treated as statistics for relocation. A few people in Sutherland still cut peats. 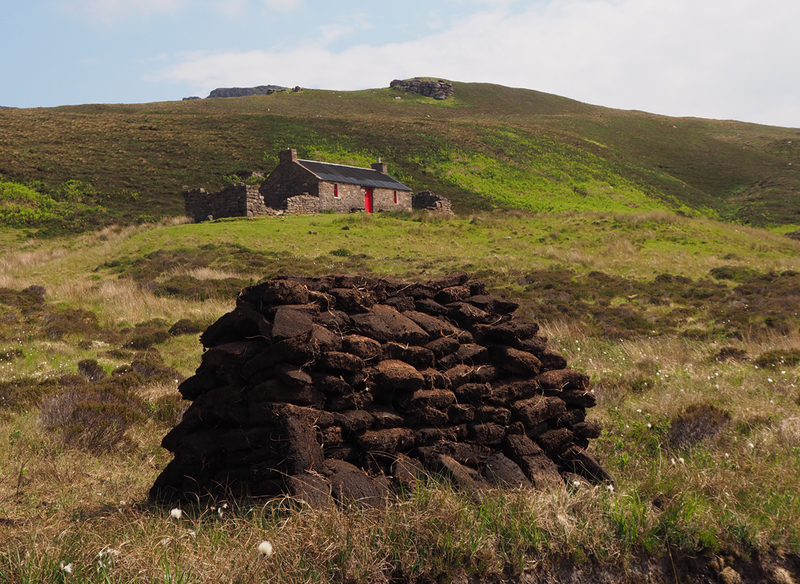 At Strathan Bothy the mysterious Peat Fairy cuts a store of fuel for long-distance walkers doing the Cape Wrath Trail. 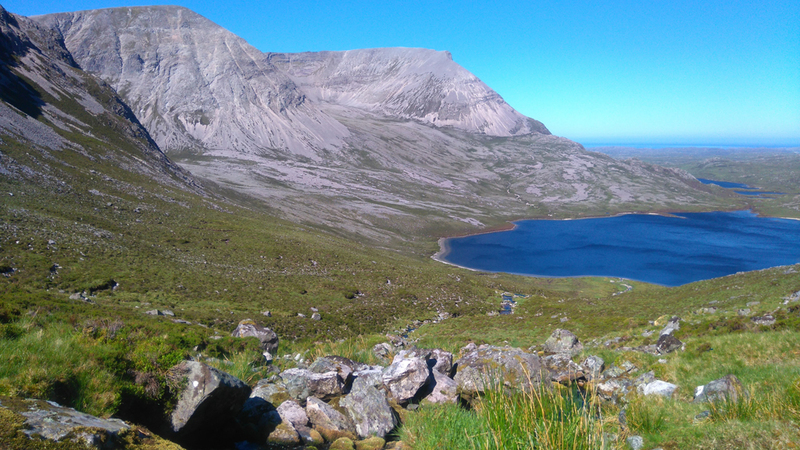 The Loch of the Corrie of the Green Waterfalls! This spring emerges high up in the complex and convoluted geology of the district. It was in Sutherland that the concept of ‘thrust zones’ (strata of rock moving sideways, over each other and folding) was first developed to account for otherwise inexplicable features. The theory is a precursor of the modern science of plate tectonics. This is hallowed ground for geologists. The whole district now has international status as a UNESCO Geopark. 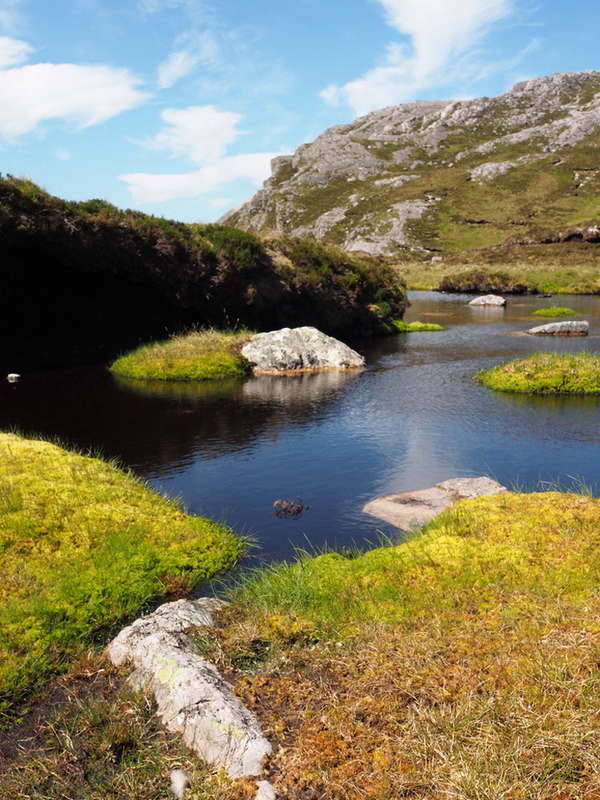 There is an interpretation centre at Knockan Crag and a Rock Stop Shop in Unapool. Three men and a dog are glad to be nearly home after a hot day on Arkle. The stone in Sutherland doesn’t break into flags as it does in Orkney and Caithness. But there are clever people can build dykes from irregular rocks. 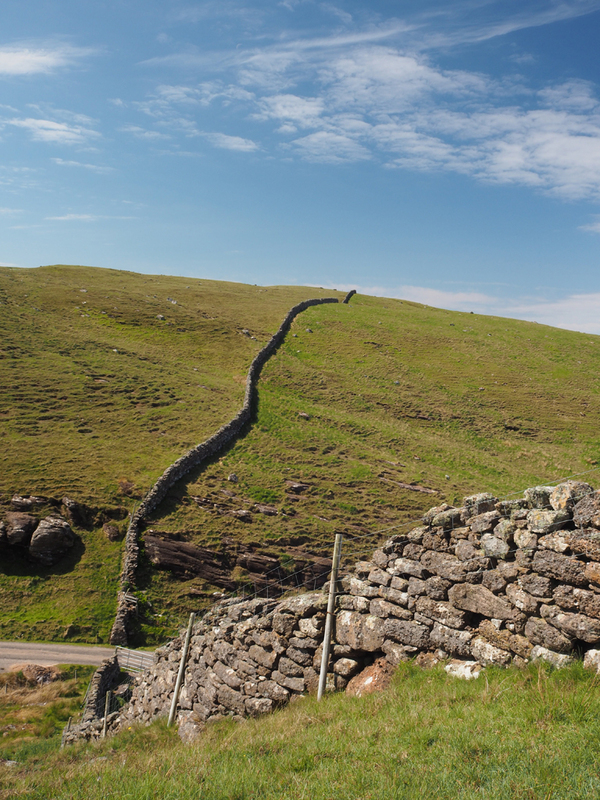 This wall at Sheigra is made from Torridonian sandstone. A kilometre south of here the rock is Lewissian gneiss, which at 3 billion years old, is the oldest in Europe. It forms the basement layer for the whole of the north of Scotland. Look again at the Droman Pier photo. On the bench side is gneiss. On the far side Torridonian sandstone which is ‘only’ half a billion years old. It is still far too old for any fossils. 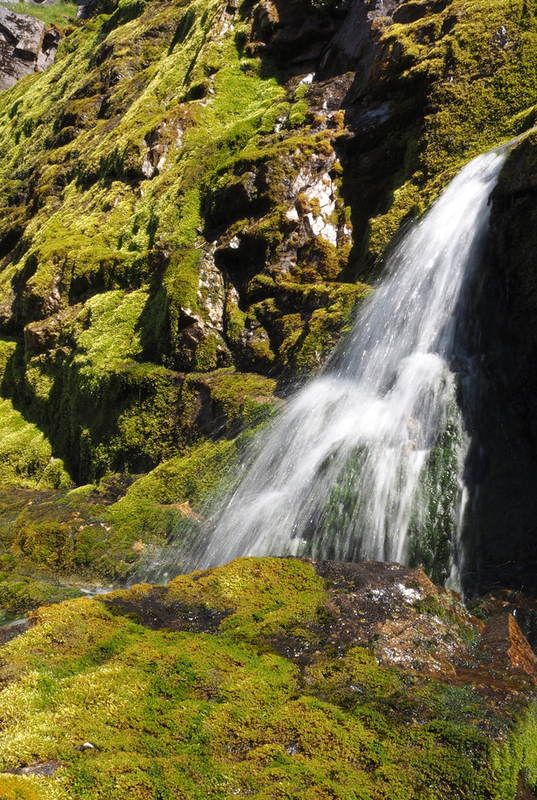 Sutherland is an ideal place for outdoor education. 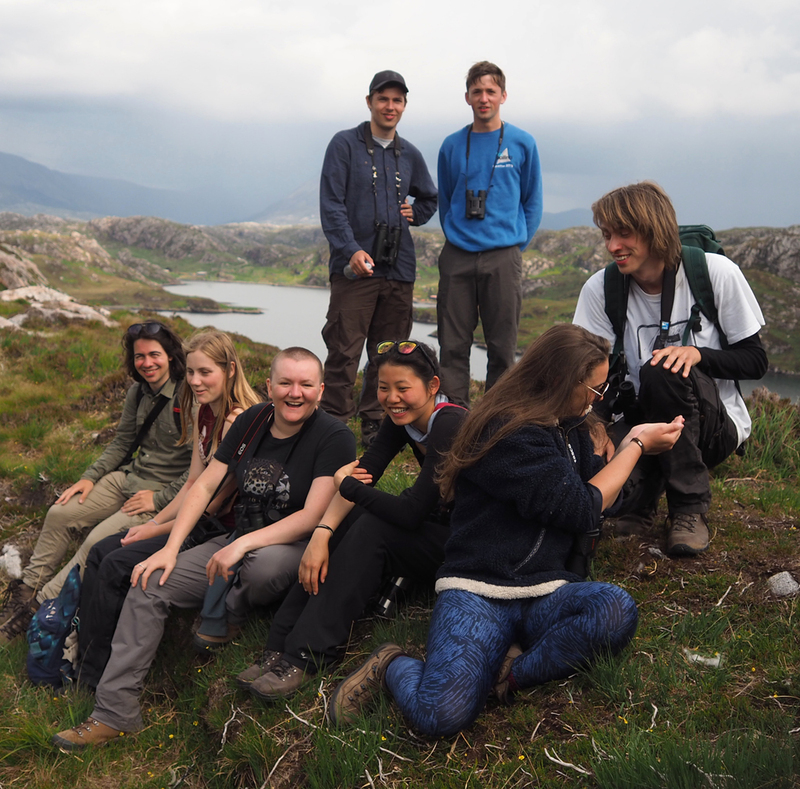 These students are from Exeter University on a Biological Sciences field trip. Behind them, across the sea loch, is the Ridgway Adventure School. I hope you enjoyed looking at the photographs and have learned something about Sutherland. The landscape and people of Sutherland, and also Easter Ross, will be featured in the 2018 Orkney International Science Festival in various talks on the afternoon of Wednesday 12 September. Bob Tateson was born in Rotherham and did his PhD at Edinburgh University. After working as a geneticist at the Sick Children's Hospital he 'dropped out' and went back to Sheffield to work in the steel works. He was eventually washed up on the shores of Orkney where he survived for many years as a coal man, chimney sweep, crofter, and milkman before submitting to fate and becoming the maths/science teacher on Stronsay for 16 years. He is now retired in Kinlochbervie, surrounded by happy Olympus lenses.